There are several good reasons not to attempt remodeling your bathroom yourself at all. Yes, beginners can learn to install tile and pre-fabricated cabinets. And yes, some small fixture changes don’t require a professional. However, the bathroom can quickly turn into one of the most complicated remodeling projects you will face. One of the things we routinely see, especially in old bathrooms, are hidden problems that make a quick flooring change into a nightmare for DIYers. You are very likely to find rotting subfloor and joists that have been sitting under that old tile for years; the result of decades-old leaks. Plumbing stacks that are rusting and compromised are another frequent nasty surprise. Once you uncover those, say goodbye to your timeline and your tiny budget. The great thing about hiring the pros is that they’re going to factor in contingencies like this. Unless you want to use a bucket outside for the duration of your summer break, you want to hire professionals if you have only one bathroom that needs to be overhauled. Even a moderate change will take the average homeowner many months to complete. That’s a long time to live with a mess or a less-than-functional bathroom. In contrast, a team of professionals will have your old vanity out before you take off for work one morning, and a new floor installed before lunchtime. You can expect to have your brand-new bathroom in working order in a couple of weeks, tops. Most DIYers and wanna-be DIYers look at the highly-produced before-and-after shots and assume they can save a ton of money. How hard can laying tile be anyway? I’m here to tell you: it’s a highly skilled trade for a reason. When you pay a professional, you are not just paying for efficiency. You are paying for your bathroom to look nice. 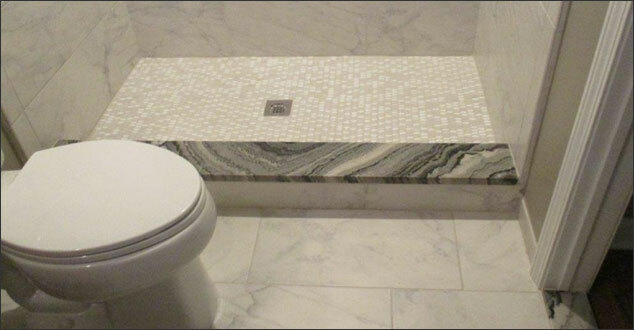 Tile cutting gets complicated around all the little corners you have in your bathroom. Homeowners can’t hope to equal the smooth surface a professional drywaller can get. In addition, when it comes to installing cabinetry and countertops, precision is needed there as well. The frustration involved in working so hard for a less-than-perfect result may not be worth the money you save. While it may be tempting to try to save money by remodeling your bathroom yourself, you probably aren’t considering the hidden problems, costs, time, and frustration involved in taking on this task. Most parts of a new bathroom require professional-level skill. Ultimately, the efficiency and beauty you get when you hire competent pros is worth every cent. If you live in the Southeast Michigan area, please give us a call. We would be honored to help.